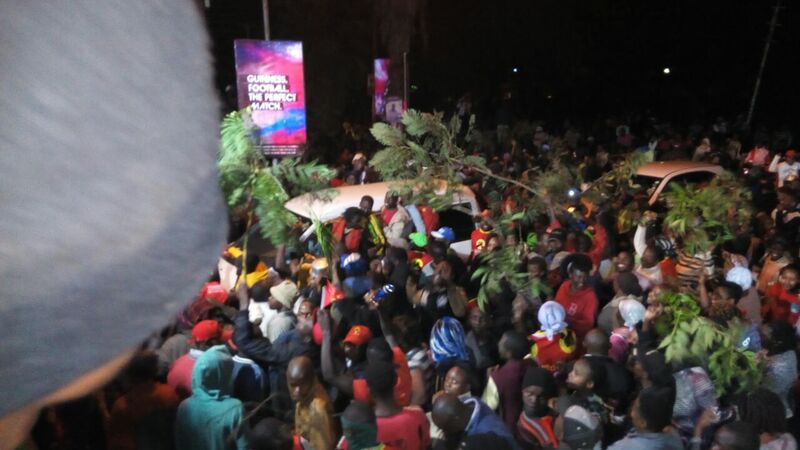 Home EVENTS MTAANI NEWS Thika erupts in song and dance to celebrate Uhuru’s win. Thika erupts in song and dance to celebrate Uhuru’s win. Thika town erupted into song and dance immediately after the chairman of the Independent Electoral and Boundaries Commission (IEBC) Wanyonyi Wafula Chebukati declared President Uhuru Kenyatta as president of the Republic of Kenya for a second term at the Bomas of Kenya. Donned in Jubilee regalia and carrying Uhuru’s portraits, Jubilee supporters moved up and down the streets chanting his name and that of his deputy William Ruto. There was deafening noises from vuvuzelas and whistles emanating from virtually all the estates, with the jubilant wananchi heading to the town’s CBD to join their colleagues whose celebrations had already kicked off shortly before the IEBC had announced the final presidential results. The residents had gathered at social places, homes and inside electronic shops to follow events happening at Bomas of Kenya where the winner was announced. At the pubs and hotels, business was brisk as customers flocked in to follow the events. A carnival mood engulfed the town and its environs immediately after he was declared the winner. 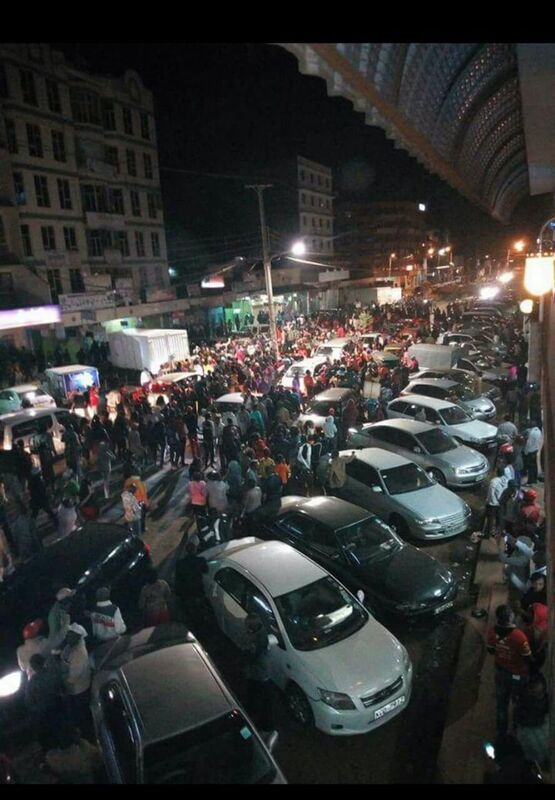 The town’s major streets, including Kenyatta Highway and Garissa Road and entire Central Business District were turned into celebration venues, paralysing activity for over 3 hours. Huge crowds waving twigs, Jubilee Party banners and blowing vuvuzelas celebrated at Kiganjo, Makongeni, Kiandutu and other areas. 55-year-old Kenyatta garnered slightly over 54% of the vote Kenyatta to beat his worthy opponent 72-year-old Raila Odinga, who tallied 44.7% of the vote. Uhuru had 8,203,290 votes against Raila’s 6,762,224 votes. Uhuru met the 50+1 threshold of the total votes cast and had 25% of votes in 35 counties while Raila got 25% in 29 counties. The 2017 general election had a voter turnout of 79.17%. Chebukati said despite the few challenges the election process was generally successful. He also thanked the international observers who also confirmed the credibility of the election. “Having fulfilled the requirements of the law, I wish to declare Hon. Uhuru Kenyatta as the president-elect and Hon. William Ruto as the deputy president elect of Kenya,” Chebukati announced at 10 pm. Hours after voting ended, Raila called a press conference saying that the IEBC system had been hacked and Presidential results compromised. He urged Kenyans to reject the results. IEBC responded by stating that the results on their portal were provisional and the final tally would be released after validating forms 34A and 34B. IEBC chair Chebukati said he was not sure whether the server had been breached or not. Later, IEBC CEO Ezra Chiloba was categorical that there was no attempt to hack the system. As soon at Chebukati announced the results, Uhuru addressed the country in a 10 minutes acceptance speech. “God is good?” Started Uhuru. “All the time!” responded the enthusiastic crowd at Bomas. Uhuru started by thanking God, Kenyans, all the supporters of Jubilee, IEBC and international observers. “On behalf of my family and the family of my deputy President William Ruto, I am thankful for the confidence you have shown to me and my administration,” he said. The President-Elect also extended a hand of friendship to Raila. “We all belong to Kenya. I extend a hand of friendship and corporation. We shall work and partner together so we can build Kenya,” Uhuru said. Uhuru now starts his second term as the fourth President of Kenya after a neck and neck race with NASA’s presidential candidate. This is Raila’s fourth attempt at the presidency. In 2007, he lost to Mwai Kibaki in a highly disputed election that resulted in violence. The post-election violence left over 1,000 people dead and thousands displaced. The crisis was solved after Kibaki and Raila agreed to form a coalition government. Raila became the Prime Minister.